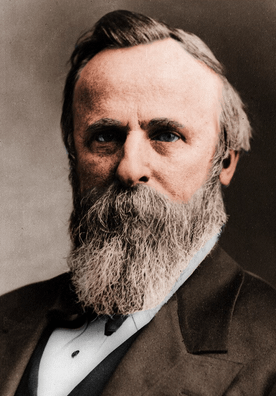 At the end of the Reconstruction Era, Rutherford B. Hayes became the 19th president of the United States. As President Ulysses S. Grant before him had done, Hayes led efforts to try and bridge the giant divide that had grown between the North and the South. However, Hayes chose to end Reconstruction and instead focused on letting the South rebuild its own states. Hayes was brought up by his mother after his father died right before he was born. From an early age, he was sent to well-known schools in Ohio and Connecticut. He attended Kenyon College, where he did well and became involved in Whig politics. Hayes graduated Kenyon College in 1842 as class valedictorian. He then attended Harvard Law School and was admitted to the Ohio bar in 1845. He started his law practice in Lower Sandusky, Ohio, but eventually moved to Cincinnati when business remained low. In 1852, Hayes married Lucy Webb; they had three sons. Rutherford B. Hayes began his political career as a Cincinnati city solicitor. However, once the Civil War began, Hayes joined the Union Army. During the Civil War, he was promoted to major general. After the war, he returned to politics and held positions in Congress under Republican billing. In 1868, Hayes was elected governor of Ohio, where he served three terms, two of which were consecutive. In 1876, Hayes was elected president after winning a close race against the Democratic nominee, Samuel J. Tilden. The race was disputed, and since both parties had committed frauds, the true votes were uncertain. In the end, a bipartisan electoral commission was put in place, and Hayes won all 20 of the contested electoral votes. Once again, the Democrats challenged the votes and the Republicans had to make agreements to allow the South the right to elect its own officials and full withdrawal of Southern federal troops. During his presidency, Hayes tried to protect the rights of Southern blacks; however, his efforts were futile. Hayes dealt with the Great Railroad Strike of 1877 — during which railroad workers protested several cuts made to their wages and walked off the job — by sending troops to ensure that no riots broke out. Throughout the strike, riots spread through several states, causing some deaths among the federal troops and the workers on strike. However, federal troops were not responsible for any of the deaths. Hayes granted the U.S. Army power to cross Mexican borders to pursue bandits, an order that was protested by the Mexican president. In the end, both presidents agreed to pursue bandits jointly, and border violence was effectively decreased. During Hayes’s presidency, the White House became an alcohol-free zone.